It is very tough to beat the enjoyment of a Peter Swanson novel. Swanson came out of the gate quickly and strongly with THE GIRL WITH A CLOCK FOR A HEART and never looked back. His newly published fourth novel is textbook Swanson. Like its predecessors, it is totally different in subject matter than his other books and is full of twists, turns and surprises experienced by unforgettable characters. 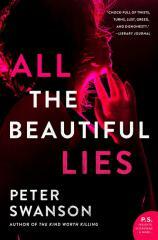 ALL THE BEAUTIFUL LIES ping-pongs between the book’s present and past. In the present, Harry Ackerson is awaiting his college graduation ceremony when he receives terrible news in the form of a phone call from his stepmother, Alice. Harry’s father, Bill, has died suddenly while taking his usual evening walk on a cliff path near his home in tiny Kennewick Village, Maine. The death is originally written off as an accident, but as the story unfolds, investigators begin to suspect foul play. "[T]he conclusion to this fine story is laced with dark beauty and tinged with irony and kismet. Swanson meets and exceeds the promises made by his previous work." There is some question as to who would want to harm Bill. He was a respected but quiet bookseller who had established his reputation with a shop in New York, which he sold before moving back to his hometown in Maine and opening a store there. He seemed like the type who would go out of his way to avoid an argument, happy instead to compile lists of books under various topics and displaying an almost encyclopedic knowledge of mystery and detective fiction trivia, while he and an assistant operated what was primarily a mail-order book business. It is Alice who seems to hold the key to both the doer and the motive. She tells Harry and the police about a former employee of the bookstore who she believes was having an affair with Bill and whose husband is infamous for his violent temper. Harry doesn’t know what to think, especially with respect to Alice. Bill and Alice married when he was a senior in high school. He has quietly and secretly nursed an attraction to her that may now be reciprocated. Meanwhile, an enigmatic young woman seems to haunt the vicinity following Bill’s death. Harry sees her around his father’s house, at the periphery of the funeral, and ultimately at the bookstore. She has a story to tell as well, one that slowly unfolds over the course of the book. As for the narrative dealing with the past, we learn quite a bit about Alice. She experienced a tumultuous upbringing that would give a clinical psychologist much with which to work. The past raises some issues in the present, which are slowly revealed, particularly throughout the book’s last half. The title is ironic. There are many lies revealed within, but none of them are especially beautiful. However, the conclusion to this fine story is laced with dark beauty and tinged with irony and kismet. Swanson meets and exceeds the promises made by his previous work. Part of the book’s genius is that, with a change here and an edit there --- well, perhaps several of both --- this could have been a cozy novel, given its New England setting and focus on bookselling. It is most definitely not. It’s dark as dark can be, and I loved every word.